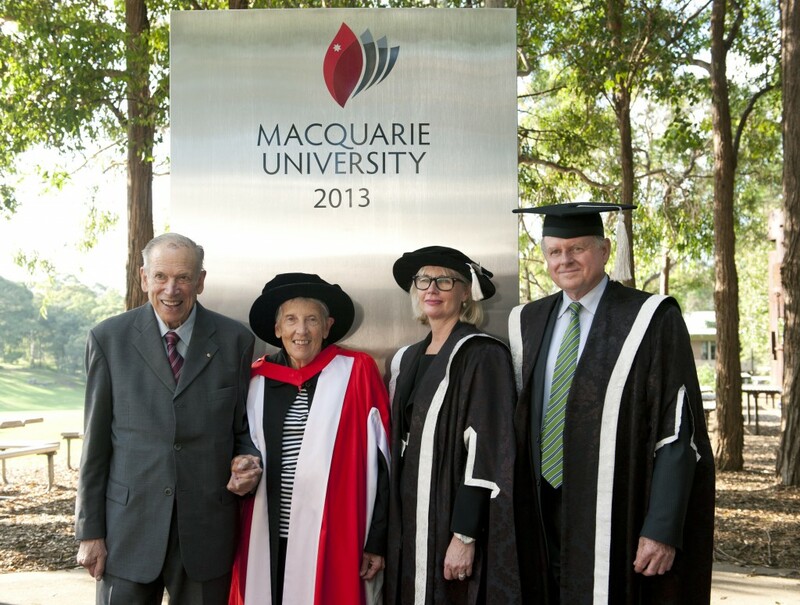 Professor Emerita Jillian Roe was first appointed to teach history at a newly-founded Macquarie University in 1967. Forty-six years later, she has now been awarded the prestigious Higher Degree of Doctor of Letters from the same institution, at yesterday’s graduation ceremony for the Faculty of Arts. In a separate tradition to the honorary doctorates often presented at graduation ceremonies, a higher doctoral degree is awarded to candidates who are assessed by their academic peers as being a recognised authority commanding international attention. Recipients of this prestigious award have contributed significantly to the advancement of learning by extensive original contributions. From her first publication on Miles Franklin, an article in 1980, to the publication of her magisterial Stella Miles Franklin: A Biography in 2008, Roe has gained a reputation as an authority of international standing and a leader within her field of scholarship. She has published books on urban and social policy history in Australia and is now the leading authority on the life and works of Australian writer Stella Miles Franklin. Her biography of Miles Franklin has been described as one of the best biographies produced in western scholarship written with wit, charm and erudition. It was awarded the Queensland Premier’s History Book Prize for 2009, and the South Australian Premier’s Non-Fiction prize and the Magarey Medal for Biography in 2010. Her work has laid the basis for other academics while setting an enviably high benchmark. Future scholars in women’s history and Australian history owe her a great deal. Roe’s published works – her two pioneering scholarly editions of Franklin’s writings and her major biography of Franklin, and the Harvard essay that situates Franklin in the global intellectual and activist context of ’Australian Women in America’ – change the way Australian culture must be understood and interpreted for future generations, through its arguments for the achievement of one of its formative figures. The importance of the quality of her writing cannot be underestimated. She has set an excellent standard for the quality of her writing in the field of biography, or more widely, creative non-fiction. She served as the Director of the Macquarie PEN Anthology at the Australian Literature Centre, was a visiting Professor of Australian Studies at Harvard University from 1994-1995, Honorary Visiting Fellow at the Schlesinger Library, Radcliff College in 1999 and Chair of the Editorial Board of the Australian Dictionary of Biography. Roe was President of the Australian Historical Association from 1998–2002 and held leading positions in the NSW History Council from 2005–2008. 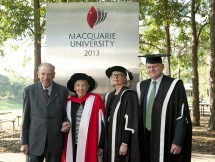 Emeritus Professor Bruce Mansfield, Professor Emerita Jill Roe, Professor Gail Whiteford and Professor Jim Piper. Photo: Effy Alexakis.